Who nourishes the human beings. Just as a ripe cucumber fruit is separated from the creeper. May I be fixed in Immortality! This is the Maha Mrityunjay Mantra of Lord Shiva, muttering which 108 times one can get blessed with immortality or can escape from rebirth. Shiva, the hero of Hindu Mythology, has appeared in several forms in popular religious beliefs. While in the Puranas, he is referred to as the destroyer of evils and represents one among the three primary aspects of the Trinity, in folklores and legends, he has been depicted more as a general householder who has flaws and follies just like common men. However, Shiva in both these avatars has one thing in common and that is his residence, which has been known to be on the Himalaya. To mark his divine presence in Himalaya a number of temples are built at different heights which are rich in architectural grandeur and lets one feel the existence of that supreme soul inevitably. Located at a distance of 18 km from Rudraprayag, Agasteshwar Mahadev Temple is a popular pilgrimage destination on the bank of river Mandakini. Located at a picture perfect location, the temple presents a breathtaking milieu to meditate and seek mental peace. The temple is also known as Agastyamuni Temple and it is believed that the great sage Agastya meditated here for a couple of years. Every year during Baisakhi, a grand fair takes place here. 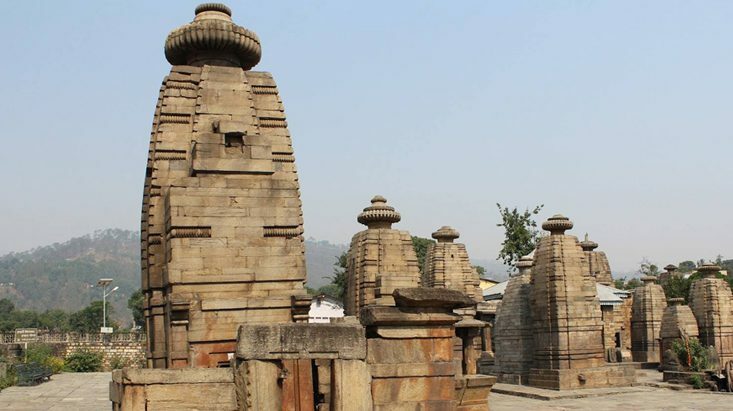 Located in Bageshwar district of Uttarakhand, Baijnath is a small town popular for its ancient Mahadeva Temple. The holy River Gomati flows by this town making it an impeccable spot to seek mental peace. The temple is at a distance of 16 km from Kausani and encompasses a couple of temples dedicated to other deities. Kot Bhramari Devi temple, a famous Shakta seat is found at a distance of 2 km from the temple. Devotees should remember that instead of the face, the back side of the deity is worshipped here. The literal meaning of Baghnath is the master of Tiger. As Shiva is found seated on a tiger skin, he is also known as Baghnath. The temple stands on the confluence of Gomti and Sarayu Rivers at a distance of 90 km from Almora, a famous hill station of Uttarakhand. During the holy month of Shravana devotees give a visit to this temple to pay their homage to Shiva, the rescuer. The temples around Baghnath are Durga temple, Dattatrey Maharaj, Hanuman temple, Kalika temple, Ganga Mai temple, Panchnam Junakhara, Thingal Bhairav temple, and the Vaneswar temple. Located in the heart of the city Champawat in the state of Uttarakhand, Baleshwar is a small temple situated at a distance of approx 74 km from Pithoragarh district. The temple of Shiva in Baleshwar dates back to 10th – 12th century and depicts a wonderful work of art on its walls and pillars. Along with Baleshwar, the temple compound also encloses the seats of Ratneshwar and Champawati Durga. Shivaratri festival is the most important celebration in Baleshwar temple. A mid altitude temple perched 2480 m above sea level, Binsar Mahadev Temple is surrounded by the natural majesty of thick Deodar forest in Chamoli, Uttarakhand. The awe-inspiring hill station of Uttarakhand, Ranikhet is only 19 km from this temple. The belief goes that the temple was built in a single day. On Vaikunth Chaturdashi ladies pay homage to this temple wishing good health of their kids and prosperity of their family. Cleanliness of the temples vicinity and fresh green background add to the exclusiveness of this temple. A calm and composed place in Tehri Garhwal district in the state of Uttarakhand, Buda Kedar is blessed by the existence of this holy temple. The temple dates back to the days of the Mahabharata and has its association with the Pandavas of Mahabharata. The temple is around 59 km from New Tehri and surrounded by the lofty hills covered with thick deodar forest. The temple gets more importance for standing by the confluence of river Bal Ganga and Dharam Ganga. The Shiva Linga found in this temple is believed to be the biggest in Northern India. A popular cave temple of Lord Shiva, Gananath is situated near Satrali village (Takula) at a height of 2116 m above sea level. The temple is at a distance of around 47 km from Almora and is thronged by people during the fair held on the occasion of Kartik Purnima. The fair is popular among the locals for its pomp and fervour. Rhythmic hymns, appealing songs and fascinating folk dance fill the air of the temple echoing with these joyous sounds. A must see temple in Chamoli district in the state of Uttarakhand, Gopinath temple is the witness to several myths and legends. The temple is located at a distance of around 3 km from the main town Chamoil. The temple stands apart for its unique worshipping style, as unlike the common Shiva temple, milk and water are not poured upon the Linga, instead only Billapatra (leaves of aegle marmelos) are offered on the Linga. It is said that in ancient times a cow used to bathe the Shiva Linga everyday with her milk. Witnessing this, the king of Katyuri Dynasty built the temple. A 2500 years old temple complex standing in all its glory with intricate designs on its exteriors, Jageshwar is located at a distance of 37 km from Almora. Surrounded by spectacular natural views at the backdrop, this temple vicinity can be an ideal retreat for those who are looking for mental peace. On normal days the temple complex remains less crowded. Folks, who love to explore architectural grandeur, must see the site to get better knowledge about the different dynasties who became the patron of the temple. Other than the abode of Shiva, the complex also houses a couple of other temples dedicated to Mrityunjay Mahadev, Surya, Chandika, Kuber, Nau Durga, Nav Graha and some other popular Hindu deities. One of the oldest and most popular seats of Lord Shiva found in Uttarakhand state, Maha Mrityunjay temple is located in the vicinity of Jageshwar. The lingam of Lord Mahadev, found in this temple looks unique for its eye shaped opening. It is believed that people chanting the Mrityunjay Mantra get relief from the fear of death and gain immortality. Popular as one of the Panch Kedars found in Dev Bhumi Uttarakhand, Kalpeshwar Mahadev Temple is situated at a height of 2200 km above sea level. Joshimath is around 25 km from the temple and Auli is just 2 km away. The temple is located in Urgam Valley where the spectacular Himalayan landscape enhances the beauty of the place. Here, it should be mentioned that this is the only Kedar temple which can be visited throughout the year. A small temple with a mysterious background, Kamleshwar Mahadev Temple is situated in Pauri Garhwal region of Srinagar, Uttarakhand. The temple is the centre of a number of popular beliefs one of which says that during the Kartika Chaturdashi if a childless couple stands in front of the temple and spends the entire night holding an earthen lamp they will be blessed with a child. During Achra Saptami, i.e., the second day after Vasant Panchami, 52 types of dishes are offered to the deity. A popular cave temple in the Soar Valley nearby Thakaura Village, Kapileshwar Mahadev is situated at a distance of 3 km from Pithoragarh district. Lofty mountain ranges coated with thick green vegetation surround the temple from all sides. Witnessing the fascinating sight of Soar Valley will be worth it. It is believed that Sage Kapila meditated here. One of the main attractions of Chota Chardham Yatra and the most important Shiva temples in Uttarakhand, Kedarnath Temple is located at a height of 3586 m above sea level. The temple is located in an awe-inspiring setting enhanced by the panoramic views of the mighty Himalaya. It is believed that the original temple was built by the Pandavas of Mahabharata. The temple remains open only during summer and in winter season the idols are taken out to Ukimath as the way to the former temple remains totally blocked by snow. Located at a distance of only 3 km from Rudraprayag Town, Koteshwar is a divine destination near Alakananda River. It is believed that Lord Shiva meditated in the cave of Kotehwar Temple to get rid of Bhasmasur. Though a well constructed temple stands at the vicinity of Koteshwar, the central deity Shiva is worshipped only in the natural cave. Kranteshwar Mahadev Temple which is popularly known as the Kandev or Kurmapad Temple is located on a hill top to the east of Champawat town in Uttarakhand. The temple is around 6 km from the main town and situated at an elevation of around 6000 m above sea level. A popular pilgrimage spot in Dehradun district in the state of Uttarakhand, Lakha Mandal is located on the outskirts of Dehradun town at a distance of approx 75 km. The temple depicts wonderful work of art on its walls and is surrounded by a couple of small and large shrines. There are a good number of Lingams, statues and inscriptions found in the temple vicinity. It is believed that the eldest of the Kaurava brothers, Duryodhana made the Lakshagriha in this place to burn the Pandavas alive. It is believed that the devotees visiting the temple get relief from misfortune. Madmaheshwar or Madhyamaheshwar is a quaint holy spot at a distance of 46 km from Rudraprayag. The temple stands second on the Panch Kedar pilgrimage circuit. The temple is situated at a height of 3265 m above sea level and looks immensely beautiful for the presence of the snow capped Himalaya on the right side. A navel shaped lingam of Lord Shiva is worshipped here. The architectural design of the temple depicts classic North-Indian style and mesmerizes the visitors with its scenic view. 51 km from the lake town Nainital, Mukteshwar is a holy town sanctified by the presence of Lord Mukteshwar Mahadev. The temple is located at a height of 2286 m above sea level in Kumaon Hills in the state of Uttarakhand. The Shiva Lingam of the temple is surrounded by the idols of Vishnu, Brahma, Ganesh, Nandi and Parvati. The famous rock climbing site Chauli ki Jali is located very close to the temple. 22 km from Laxmanjhula and 32 km from Rishikesh, Neelkanth Mahadev temple is located in Pauri Garhwal district of Rishikesh. The temple is surrounded by thick forest and stands close to the mountain ranges of Nar-Narayan. It is said that during the sea-churning (Samudra Manthana) performed by deities and demons, initially poisons in huge amount came out and there was none to control it. Shiva, the saviour then drank all the poison which made his throat completely blue. The shikhara of the temples depicts the same through wonderful carvings on it. The winter home of Lord Kedarnath and Madhyamaheshwar, Omkareshwar Temple is located in Ukhimath of Rudraprayag town at an elevation of 1317m above sea level. The temple looks fascinating for its impressive architectural grandeur and hue of colours. During winter season when the main temples of Tungnath, Kedarnath and Madmaheshwar start sinking under snow, the deities are brought to Omkareshwar Temple on palanquins. Located at the holy confluence of Sarayu and Kali rivers, Pancheshwar is a small temple in Champavat city of Uttarakhand. 40km from Lohaghat, the temple is located at the base of the mighty Himalayan ranges on a very calm and composed spot. Tourist should remember that Pancheshwar forms the border of Nepal. A limestone cave temple connected with several mysterious tales and beliefs, the abode of Patal Bhubaneshwar is located at a distance of 13 km from Gangolihat in Pithoragarh district. Situated at a height of 1350 m above sea level, the cave is believed to be the seat of 33 Crore deities. This mystical cave temple is around 160 m long and 90 feet deep. Several rock formations found inside the temple depict various stalagmite figures. A number of mystical things like the tongue of Kal Bhairav, Airavat of Indra, matted lock of Shiva and a couple of such surprising things are found inside the temple. A vibrant temple of Lord Shiva near Ram Jhoola in Rishikesh, Rameshwar temple is popular among the local devotees. The Shikhara of the temple looks stunning from afar for its unique colour combination. The architecture of the temple looks modern and simple. One of the five interrelated spots of the popular Panch Kedar, Rudranath Temple is situated in Chamoli district of Uttarakhand. The route to the temple is a little treacherous and considered to be the toughest among the five temples. The idol of Shiva remains covered with a mask which makes his look angry. However, during his daily bath when priests take off the mask his actual pleasing look can be witnessed. By the Rudranath Temple, the holy river Rudraganga flows which is also known as Vaitarani. A quaint village with calm and composed environment, Someshwar is blessed with the presence of this sacred temple. It is around 11 km from the beautiful hill station Kausani. The temple is located on the Kausani – Almora road. People often believe that it is one among the 12 Jyotirlingas. The temples date back to the beginning of the 17th century and the idols are believed to belong to a period between 7th and 16th century AD. Around 6.5 km from the central town of Dehradun, the seat of Tapkeshwar Mahadev is a picturesque spot to visit for worshipping Lord Shiva. In Hindi, ‘Tapak’ means drip and here in one of its cave temples water drops naturally trickle down on the Shivalinga. Owing to this natural wonder, the deity is believed to be named Tapkeshwar Mahadev. This is the cave where Drona, the teacher of the Pandavas and the Kauravas used to reside with his family. Located in Triyuginarayan village of Rudraprayag district, this shrine is a very sacred place to visit. Though the temple is dedicated to Lord Vishnu, Lord Shiva is also worshipped here. The devotees held the belief that Shiva and Parvati got married in this temple. The temple is known as Akhand Dhuni Temple which means a flame keeps on burning here inconsistently. It is believed that the fire is burning since the last three Yugas. In the temple courtyard there is a source of water (stream) that feeds four nearby ponds. Claimed as the highest Shiva temple in the world, Tungnath is located at an elevation of 3,680 m just below the peak of Chandrashila. It is one of the Panch Kedars and visited by devotees in search of good fortune. It is said that the temple is constructed by Arjuna, the third of the Pandavas. During winter season, the idols are moved to Mukunath. The architectural design of the temple has high resemblance with Kedarnath, Madhyamaheshwar and Guptakashi. A 16th century temple designed with magnificent architectural excellence, Bineshwar Mahadev Temple is located in Binsar. Here the central deity is Lord Shiva. It is believed that Binsar, the captivating hill station of Uttarakhand is named after this holy shrine. The temple is constructed by King Kalyan Chand of Chand Raja Dynasty. It is a nice halt for travellers who are heading to Binsar Wildlife Sanctuary. Guptkashi is a popular religious spot in Uttarakhand state where the seat of Vishwanath, the master of Universe is situated. The temple of Vishwanath is located on the way to Kedarnath. It has religious significance just like the temple of Kashi Vishwanath in Varanasi. It is said that Shiva proposed to Parvati in this place before commencing their marriage in Trijuginath. The temple looks impressive for the presence of snow packed mountain peaks of Chaukhamba. Located on the Rishikesh – Gangotri route, Uttarkashi is the gateway to the holy temple of deity Ganga (Gangotri). The temple of Lord Vishwanath is located in this serene location. Inside the temple complex, there are smaller shrines dedicated to Shakti. There is a giant brass trident in the temple premise which is inscribed with the description how the temple was built. Devotees approaching towards Gangotri temple can visit the temple of Vishwanath in the evening when the temple premise echoes with the sound of rhythmic chanting of Purohit and the sound of bell enhances the divine feel. Popularly known as the temple of Bara Jageshwar, this holy shrine of Lord Shiva is located 3km uphill from Jageshwar which is around 37 km from Almora. Lord Shiva is worshipped here in the form of an aged man. Just like Jageshwar, this shrine is also surrounded by dense Deodar forest and experiences salubrious weather all through the year. There is another temple in between Jageshwar and Vriddha Jageshwar, which is known as Baal Jageshwar. There are several anonymous temples inside the caves and folds of the Himalaya which are the centres of several untold mysteries. Devotees from across the world pay visit to these temples to get blessed with good fortune. However, those who would love to go adventurous along with paying homage to the deity; the temple of Panch kedar is an unbeatable option for those fun loving souls. Moving over the arduous route when one reaches the abode of serenity the soul gets imbibed with divine pleasure of meeting the Supreme Being. Moreover, the presence of most of these temples by the cascading riverside lets one feel captivated with the charisma of sheer divinity.